Outline is a powerful note taking app for students and teachers. The app is free today for a limited time, its regular price is $5,99. Outline enables you to quickly capture and record your ideas, organize your notes, sketch your thoughts, and annotate documents. You can either write, type or draw your notes anywhere on the page. Using the built-in styles, lists and tables, you will be able to visualize your data, structure your notes and organize your to-do lists into a highly intuitive interface. And if you like to handwrite your notes, use either your finger or one of the supported styluses (e.g Adonit JotScript, Pogo, Apple Pencil) and write in the zoomed area. Outline also offers a set of interesting tools to use for drawing, annotating and highlighting text, images and printouts. 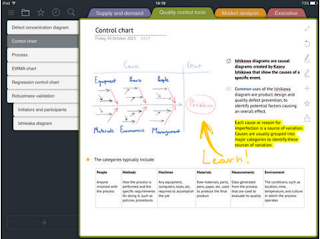 You can also attach files to your notes or insert printouts for annotations. Other features provided by Outline include : compatibility with Microsoft OneNote, automatic or manual backup of notes to iCloud, share your notes to third party apps such as Dropbox, Box, and iTunes; protect your notes with a password and easily multitask using things such as Slide Over, and Split View.